Flip through the 2019 Women in Sport Conference Guide below for all the important conference details! 90 + participants attended the 2018 conference from 24 communities across the province and Ft. St John and Vancouver, BC. This event featured top-notch leadership, coaching, and referee development sessions designed to empower and inspire female leaders. Keynote speech and custom coaching session – We were thrilled to welcome keynote speaker, Andrea Neil to the conference. Andrea is a former Canadian Women’s National Team Player, Canada Sports Hall of Fame inductee, and USSF National ‘B’ Licensed and UEFA ‘A’ Licensed coach. Andrea also lead a custom coaching session for participants. She is both a highly skilled coach and passionate leader on the topic of sport and its role in character development among girls and women. Intercultural Communication Skills Training – In this custom session, participants learned to build awareness about cultural values and biases and strategies they can integrate when coaching, officiating, playing, or other roles to combat them in their daily life; led by Stacey Busse, Bow Valley College School of Global Access, who has 15 years’ experience facilitating these workshops. The 2017 Women in Soccer was held in Red Deer on May 5-7, 2017. The soccer community needs more strong, skilled women in leadership roles – and this unique conference was created with that in mind! 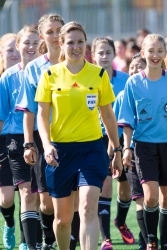 Chantal Boudreau, a referee whose journey from an entry level referee to FIFA Assistant Referee only took her five years (of hard work and commitment!). Speakers included Vicki Harber from Canadian Sport for Life, Karin Lofstrom, Executive Director of CAAWS and Mayi Cruz Blanco, the Women’s Football Development Manager for FIFA. Participants also received tickets for the record setting opening matches of the FIFA Women’s World Cup Canada 2015. The Development of Women in Soccer Committee’s mandate is to promote, support and increase the numbers of female soccer participants: in leadership roles and as players, coaches, and referees. 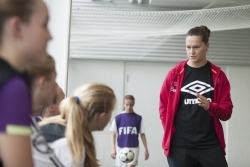 “Developing female coaches and players is essential to soccer in Canada. The women’s program is one of the most competitive in the world and in order for us to continue to rise to the top it starts from the grassroots level. “Coaching is both demanding and rewarding. An enormous amount of time and energy is committed to studying the game, preparing the athletes, coaching in the competitions and mentoring the participants in sport and life.